High Roller Honeymoon In Vegas? Why Not! Las Vegas may be known for its excessiveness, debauchery, and adult entertainment but it is a city of love too. In fact, it’s a favorite destination for couples celebrating their honeymoon. You and your partner should do the same too! Be like an A-List couple and stay at the Cosmopolitan of Las Vegas. Located Strip-side, this mega-resort houses 2,995 rooms and boasts of sleek, modern interiors. While all the suites in Cosmopolitan are honeymoon-worthy, choose the Wraparound Terrace Suite. It is an impressive 1,200 square-foot suite with one bedroom and a king-size bed. The suite also has a separate dining area and a modern kitchen that’s equipped with a mini-bar, Sub-Zero wine chiller, store, oven, and a microwave. But the highlight of this suite is its wraparound terrace. Slide open the glass doors and step out into the 480- square foot wraparound terrace. You’ll be able to see the beautiful Vegas skyline and the surrounding buildings on The Strip. There are so many noteworthy restaurants in Vegas but Picasso at the Bellagio and Joël Robuchon Restaurant are the two places you should definitely visit while on your honeymoon. With Executive Chef Julian Serrano at the helm, Picasso is definitely a gem in Vegas. It has an extensive pre-theater, prix fixe, vegetarian, degustation, truffle, and dessert menus that includes poached oysters, halibut, veal chop, foie gras au torchon, Chilean sea bass, and more. To truly enjoy their signature French cuisine, dine outdoors at their lakefront terrace where you’ll have an amazing view of the Bellagio Dancing Fountains. Joël Robuchon Restaurant is a 3 Michelin Star French restaurant. 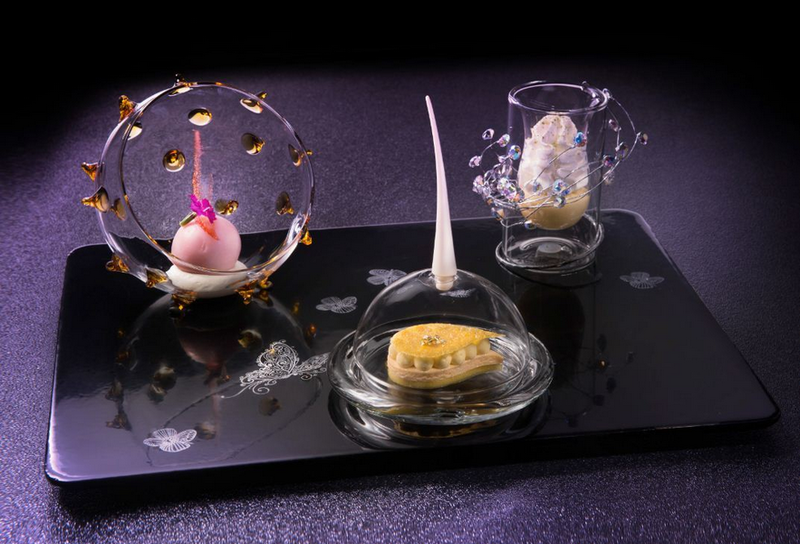 Its delicious tasting menu includes Oscetra cavia with king crab, foie gras and potato carpaccio with black truffle shavings, salmon confit, black truffle tart, and many more. The restaurant’s unparalled cuisine matches its impeccable marble floored interior and lush garden terrace. Magical! Stunning and opulent, the impeccably designed Encore Spa is the best place to relax with your new spouse when in Vegas. This 2016 Forbes Travel Guide Five Star award-winning spa offers special couples’ ritual massages that effectively stretches and relaxes the entire body. Try their signature Couple’s Good Luck Ritual. Created to promote luck, prosperity, and happiness, the massage is a combination of foot treatment, scalp massage, hand therapy, and custom full body massage. Obtaining a limousine service from Earth Limos & Buses is the best way to go around Las Vegas. With your very own chauffeur, you don’t have to worry about parking, not knowing where to go, or restricting your alcohol intake. Complete your high roller honeymoon experience and call up Earth Limos & Buses at 725-777-3333 or visit their website at www.earthlimos.com.